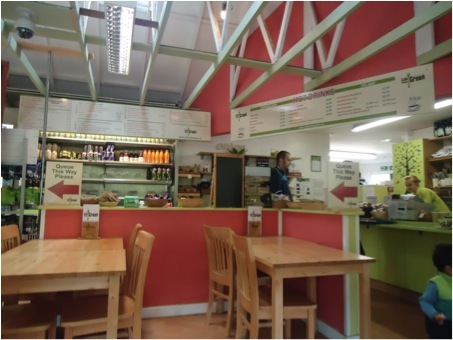 City Corner Snack Bar is a few minutes walk from Liverpool Street Station on Middlesex Street. There's a hatch outside where you can by take away food and drinks if you don't have time to stop. The interior is very classic and has remained the same for decades. The breakfast menu is quite basic and available all day. A sugar pourer is always a nice sight. The coffee was great and is included with the breakfast. The breakfast was ok but not particularly big. 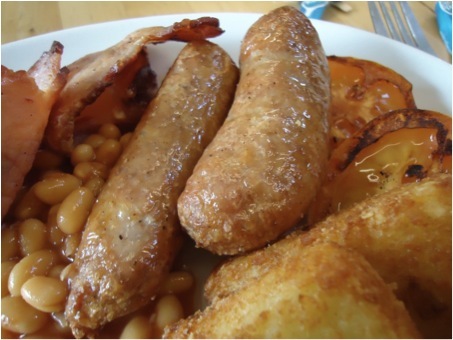 I am not a fan of chips on breakfasts but I did quite enjoy them, the best part was the sausage which initially looked cheap but was delicious. The mushrooms were nice enough but the bacon was tough. The egg wasn't looking too good. I did eventually discover it had a good runny yolk though. The ketchup was quite thin and almost glowing. The veggie breakfast was an interesting mix, the chips and cheese were an unexpected extra. 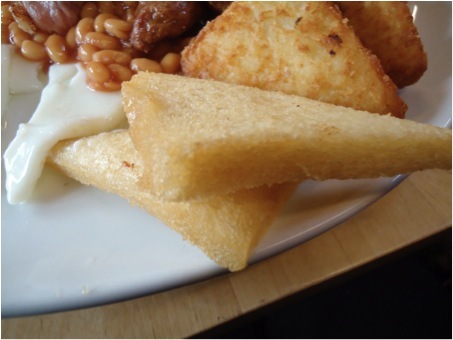 One slice of toast came with all breakfasts except the full monty, very strange? Another month had passed and we found ourselves back at Liverpool Street Station ready to spend the day on my wife's stall at Spitalfields Market. A perfect excuse for another inspection before heading to the market. I had been meaning to visit City Corner Snack Bar for sometime now but as they didn't open until 9am had on two other occasions headed to places opening a bit earlier. This time though we killed time at the station first and they were open when we finally arrived so in we went..
Veggie option - Yes, as seen in photo above and includes a hot drink and slice of toast for £5. In need of some lunch we discovered this Full English Burger on the menu at The Woolpack. This is how it looked on the menu, it certainly looked as impressive when it arrived! 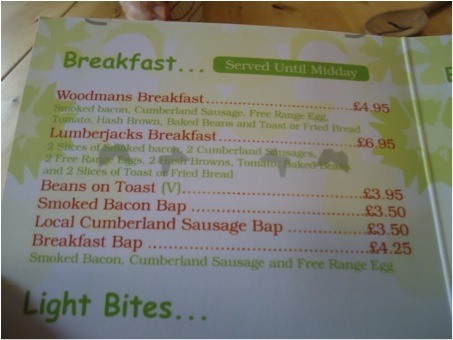 It was packed full of breakfast items, was well worth £7.49 and you will struggle to finish it. 2 quarter pound burgers, bacon, sausage, fried egg, mushrooms, beans and lettuce in a bun topped with 3 onion rings and served on top of a bed of chunky chips with a pot of bbq sauce. Everything was cooked nicely and the Heinz BBQ sauce made a great dip. A nice twist on the Full English breakfast and you will have fun trying to eat the burger without making a mess! 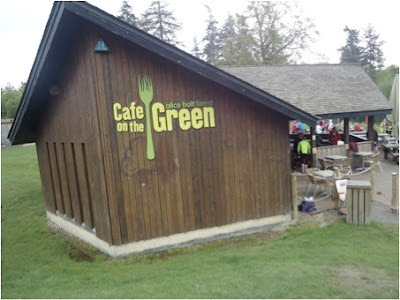 I spotted an all day breakfast on the menu too so expect a fry up inspection soon..
You can find Café on the Green near the car park in Alice Holt Forest. 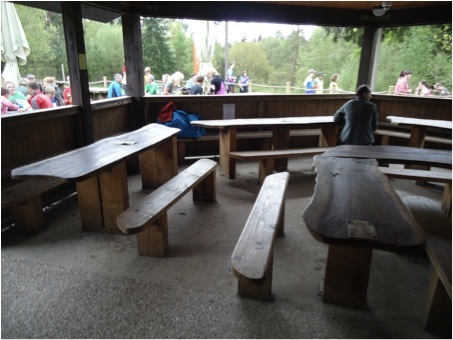 There are plenty of places to sit either outside under cover, and there’s some further decking for if the weather is decent. Inside there are plenty of tables but it is still spacious. 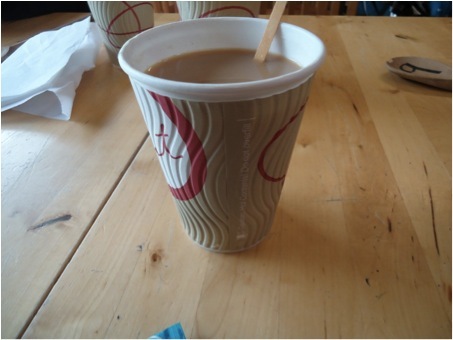 Collect your drinks when you order, your food is brought to you. Not an award winning selection of condiments, but jugs of milk do beat a tiny carton any day! 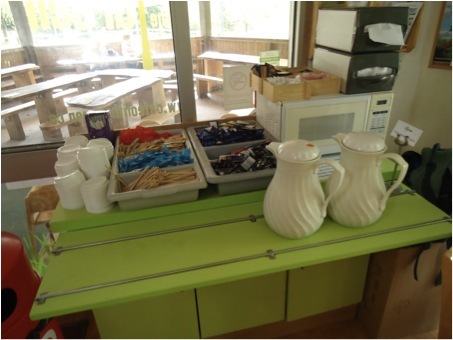 There are also facilities for looking after any baby food and bottles. The breakfast menu does the job, and is clear. Not really any vegetarian breakfasts advertised but if there are supplies I’m sure the staff would be happy to exchange items. The tea is good and strong! I don’t know how much it costs as I didn’t look, and the total price got rounded down! Here is the Lumberjack’s Breakfast which cost £6.95. Presentation was better when it arrived; I upset the fried bread stack! 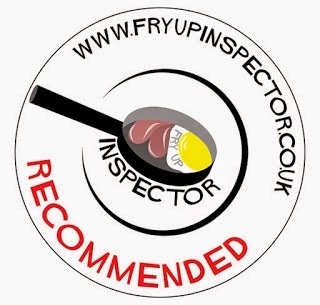 Quality meats used in the sausages and bacon, the hash browns were perfectly crisped! The fried bread had puffed out a little but was delicious to eat! The eggs were a bit undercooked though. 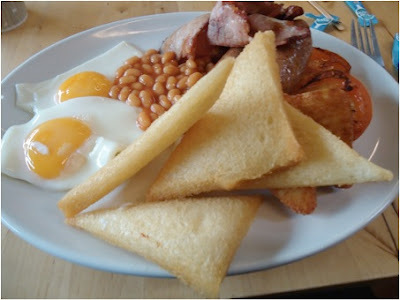 I've done a good few Parkrun events and we normally as a group look forward to a post-Parkrun fry-up at a cafe or somewhere nearby. I'd been hearing several good things about the breakfast they do at Alice Holt Forest, from quality to quantity to value for money. This in mind, I dragged myself up there for 9am with the family to see what the run and more importantly the breakfast, was all about. Forgot to check extensively. Most of the menu caters for meat-eaters however I believe if they have the right stuff to make exchanges eg from meat to veggie sausages, they probably will do.